This is the shortest of our tests with only 15 questions from the DVSA revision question bank on towing, roof racks, vehicle loading, caravans, and trailers. The average score for this mock theory test is 87%. Can you beat that? In the event of a towbar failure the cable activates the trailer brakes, then snaps. This allows the towing vehicle to get free of the trailer and out of danger. Your vehicle must not be overloaded. Carrying heavy loads will affect control and handling characteristics. If your vehicle is overloaded and it causes a crash, you’ll be held responsible. The safest way to carry items on the roof is in a specially designed roof box. This will help to keep your luggage secure and dry, and also has less wind resistance than loads carried on a roof rack. Riding in a towed caravan is highly dangerous. The safety of the entire unit is dependent on the stability of the trailer. Moving passengers would make the caravan unstable and could cause loss of control. It’s your responsibility to ensure that all children in your car are secure. Suitable restraints include a child seat, baby seat, booster seat or booster cushion. It’s essential that any restraint used should be suitable for the child’s size and weight, and fitted to the manufacturers instructions. Check the vehicle handbook. This should give you guidance on the correct tyre pressures for your vehicle and when you may need to adjust them. If you are carrying a heavy load you may need to adjust the headlights as well. Most cars have a switch on the dashboard to do this. Keep calm and don’t brake harshly or you could lose control completely. Ease off the accelerator until the unit is brought back under control. The most dangerous time is on long downhill gradients. Strong winds or buffeting from large vehicles can cause a trailer or caravan to snake or swerve. If this happens, ease off the accelerator. Don’t brake harshly, steer sharply or increase your speed. 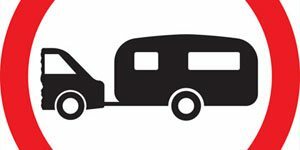 Towing a caravan or trailer affects the way the tow vehicle handles. It is highly recommended that you take a caravan manoeuvring course. These are provided by various organisations for anyone wishing to tow a trailer. Any load will have an effect on the handling of your vehicle and this becomes worse as you increase the load. You need to be aware of this when carrying passengers, heavy loads, fitting a roof rack or towing a trailer. You must know how to load your trailer or caravan so that the hitch exerts a downward force onto the tow ball. This information can be found in your vehicle handbook or from your vehicle manufacturer’s agent. A heavy load on your roof rack will reduce the stability of the vehicle because it moves the centre of gravity away from that designed by the manufacturer. Be aware of this when you negotiate bends and corners. If you change direction at speed, your vehicle and/or load could become unstable and you could lose control. Try not to brake or steer heavily as this will only make matters worse and you could lose control altogether. Keep calm and regain control by easing off the accelerator.